We gonna celebrate and party with you. The release of Kool & The Gang's only platinum-selling single was released in late 1980, well after 10-way speed star was born. Ten-way speed star competition traces its roots back to 1967 when three teams - Arvin Good Guys, the Group from Elsinore and the Old River Rats - competed at Taft, CA. The Arvin Good Guys won with two back-to-back 10-way stars. Clarice Garrison was on the Arvin team, changing 10-man to 10-way. (From Bill Newell's articles in Parachutist - The Rise and Demise of the Arvin Good Guys.) Fever for 10-way speed star competition spread from Southern California to ZHills, Hinckley, Seattle and Texas and eventually around the world and now it is making a comeback. Dive into nostalgia and organize your team for the 10-Way SPEED STAR WARS experience using USPA's no-show rules. Registration is $100 per team. Teams are required to have a captain (for us to contact) and a Videographer. Contact Marylou Laughlin to find out more. mlaughlin@skydivingmuseum.org. Register your team now!!! If you are an individual and would like to join a pick-up team go to the "Individual Registration". Marylou will find you a spot. Canopy Piloting or Swooping is one of the newest skydiving disciplines, made possible by the development of smaller and faster canopies in the mid-1990s. The first World Championships in Canopy Piloting took place in 2006. And now we bring you the exciting "For the Legends" Freestyle Canopy Piloting Meet is a high-energy, great spectator event where incredibly talented top canopy pilots from around the world will fly their canopies doing artistic maneuvers across the pond for points to win over $10,000 in prize money. Stand by and be amazed! For more info on the meet, contact Greg Windmiller at greg@superiorflightsolutions.com. Photo by Jim Harris. Jeannie Bartholomew at Skydive City. Once upon a time finding ten skydivers over 40 was a big deal and to bring together these "old-timers" Parachutists Over Phorty Society or POPS was founded in 1966. 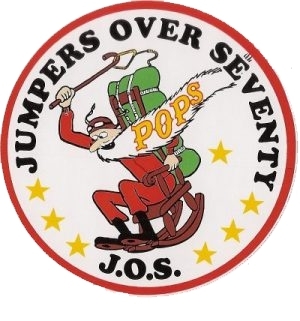 And since then POPS has spread its wings to include Skydivers Over Sixty (SOS), Jumpers Over Seventy (JOS), Jumpers Over Eighty Society (JOES) and Jumpers Over Ninety Society (JONS). 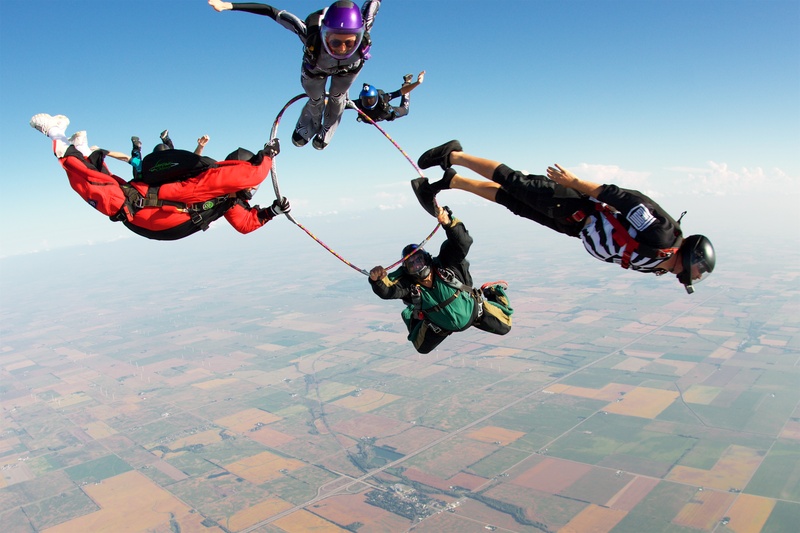 On April 22, 2018 Jumpers Over Seventy (JOS) set a new 25-way world record at Skydive Perris. Get back in the air again and have your kids or grandkids join you. 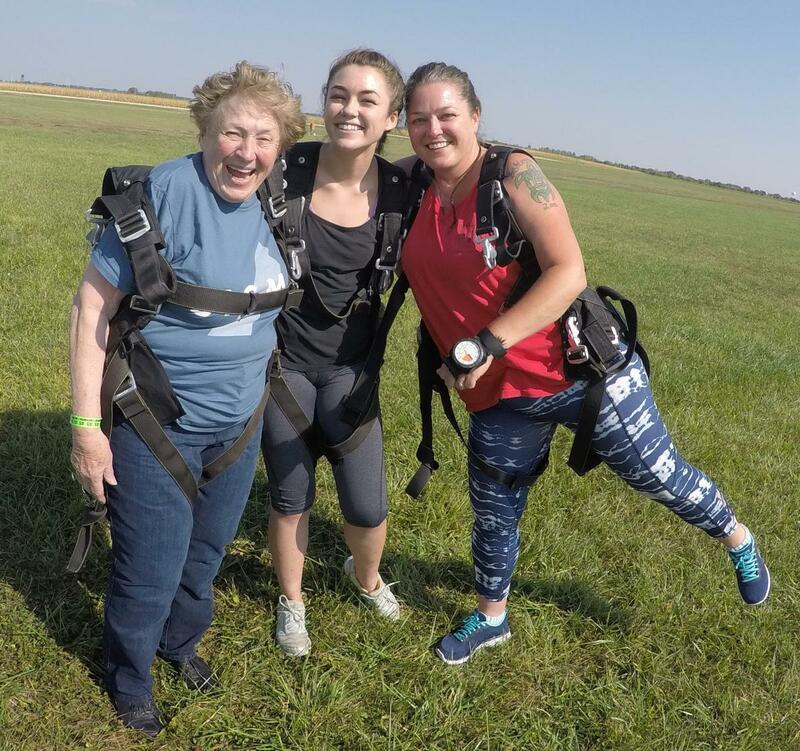 In 2017, Kim Knor did a generation jump with her daughter, Tara (right) and her granddaughter, Katie. What a way to bond! Donna Wardean made her first jump in May, 1966 at Arvin, CA. 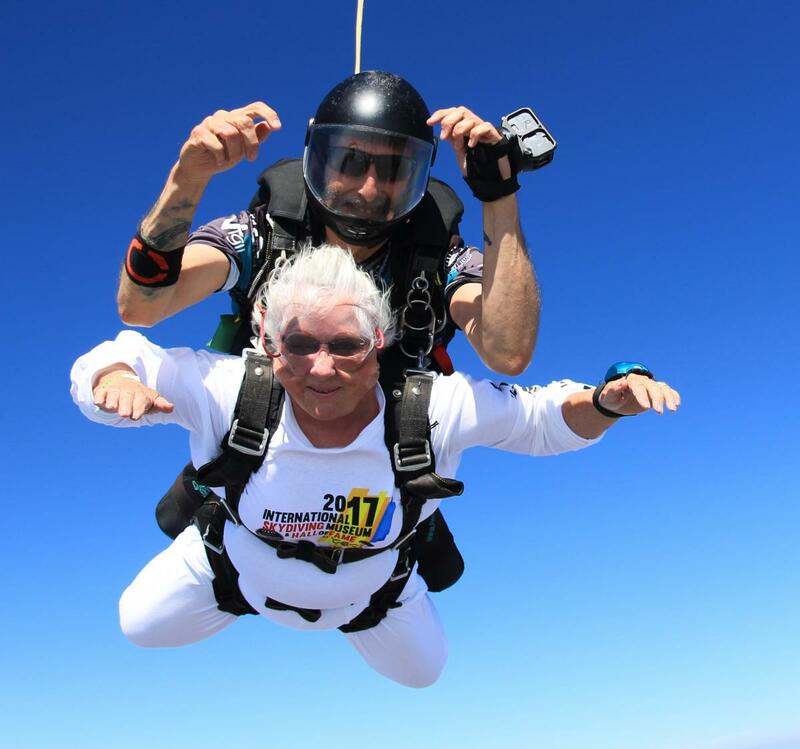 Donna said making a tandem jump "is like "putting a fish back into water." 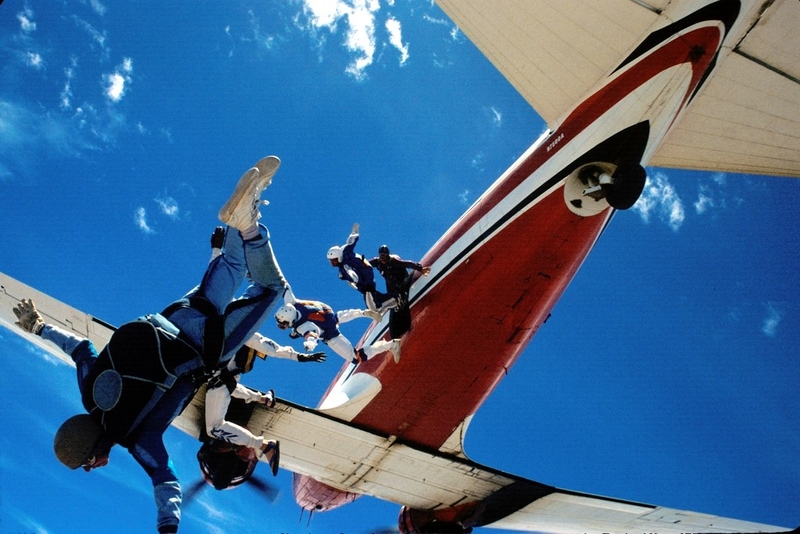 Skydive City is offering discounts for those attending the International Skydiving Hall of Fame Celebration. 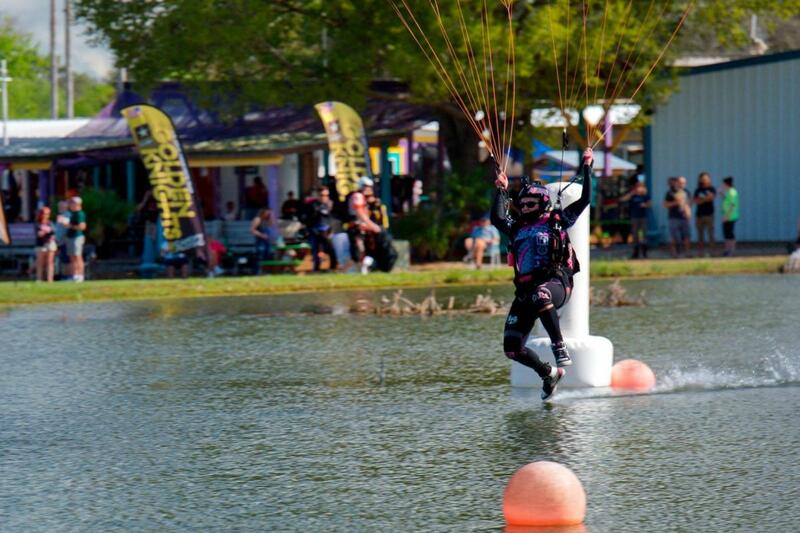 Skydive City is a leader in the world for fun jumping and load organizing. What's your pleasure - RW, freeflying, canopy relative work and pretty much any type of skydiving. Build your own load or head to Manifest, find out which loads we have organizers on, and which organizers are jumping that day. You can hook up with them and we will organize something for you to do on that load. Meet some new friends and have some fun at the same time. Now Just Jump! Check Out What Else Is Going On!